The Omni Hotel in Downtown Dallas is a pretty rainbow of colors. But every time I see it, my mind shoots back to when I wrote DANGEROUS MEMORIES and how that rainbow effect played a major part in the ending of the story. WHAT DOES NEON AGAINST A BLACK SKY REPRESENT TO YOU? This past week, I showed off a little of Dallas to a few friends. The Pegasus statue reminds me of my childhood and visiting my grandmother. It proudly stood at the top of the an oil building for 65 years. My siblings and I would try to be the first to spot it as we drove through Dallas. After dropping friends off at the Hyatt, I took my camera on a search from inspiration. My imagination started racing. I could see a heroine running, trying to hide, someone chasing, someone finding. I don’t know what story this is yet…but I like it. DO THE PICTURES INSPIRE YOU? I hope to be heading to a new location sometime this week. I’ve never been to the Grasslands in the northwest corner of the panhandle. Dalhart is the location of my second book in my 2016 Texas Rangers series. Leave a comment for your choice from the books I picked up at the Romantic Times Booklovers Convention last week. 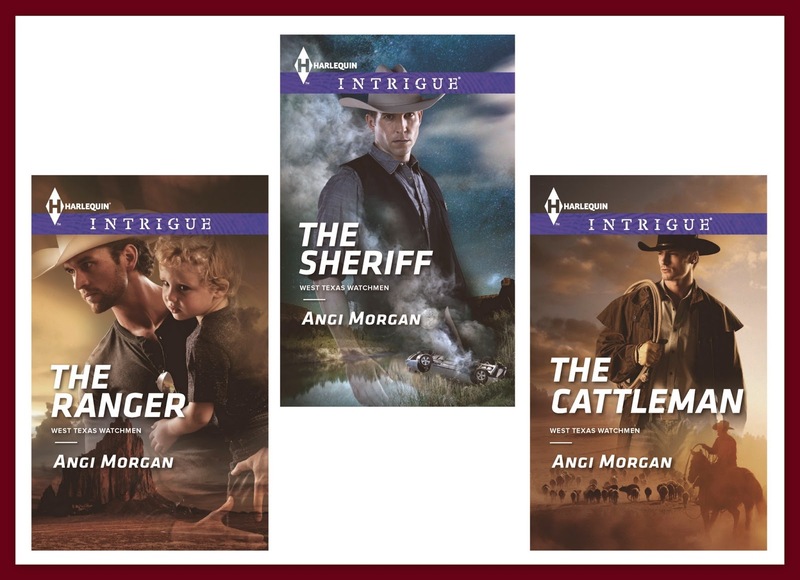 Or enter the Rafflecopter at the Harlequin Intrigue FB page to receive a KICKASS COWBOYS, COPS & KISSES tote with autographed books. WHAT’S A FAVORITE ICON FROM YOUR CHILDHOOD? Giveaway ends 11:59pm EST May 21st. Please supply your email in the post. You may use spaces or full text for security. (ex. jsmith at gmail dot com) If you do not wish to supply your email, or have trouble posting, please email maureen@justromanticsuspense.com with a subject title of JRS GIVEAWAY to be entered in the current giveaway. Favorite icon? Don't think I had one. The Beatles were introduced then. Lots of cowboy shows on TV. John F. Kennedy was President for a couple of years. I would love to win The Craftsman. Enjoy the Intrigues. debbiemac73 AT yahoo DOT com. Sorry, THE CATTLEMAN! Silly autocorrect! Good Luck Debbie. I think the Beatles were a huge icon in the 60's. I can remember walking to Jack-in-the-Box...but there weren't any McDonald's in my neck of the woods then...so no Golden Arches. So glad to share part of my city with you Delene. I would have to say The Grand Ole Opry. Loved that place as a little girl! Now I am fortunate enough to live about an hour away! I haven't been to Nashville since I was a little girl. It's on my places to go this year ! I missed that series, Jennifer. I see all the lights and think Christmas. I don't know that I had a favorite icon. You should see Dallas --they change to green and red during December. Wow so many to choose from... places, people, etc... Wildwood Beach... it was our family vacation every Summer when I was a kid! That must be an awesome memory, Colleen ! Thinking back to then my icon would be Nancy Drew. I had to look Michael up. He's a cutie.